RESERVOIR DOGS, 1992. Original Tarantino Grindhouse rolled 1 Sheet (27″ x 40″) movie theater poster for sale and starring; Harvey Keitel, Tim Roth, Michael Madsen, Steve Buschemi, Chris Penn writer and director Quentin Tarantino. 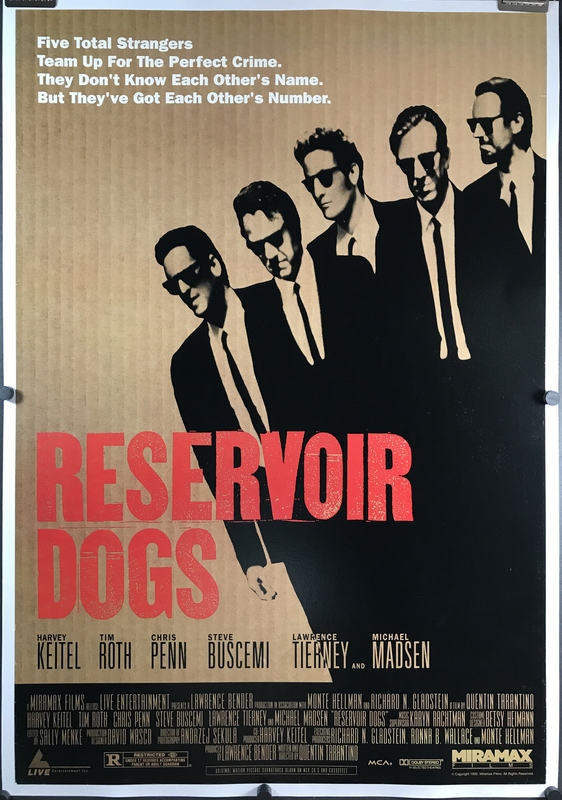 Reservoir Dogs, the break-out film for Tarantino; is a gangster movie that is so famous for its witty and philosophical dialogue. Grotesque, Gory and wonderful, this film set the stage for a career for Quentin that later influenced his films like Pulp Fiction and Jackie Brown. A lover of Grindhouse and Cult films many of his films are scenes taken from older films. What he really did which was so unique, was popularize a genre which was liked by the few in to the grind house scene. Tarantino will be the definer of the most collectible posters from the 90s; so get this original poster of the director’s first film and from country of origin! If your looking for the very cool original French 1 Panel movie poster follow the link. This poster is in very fine condition but does contain some minor imperfections to note. It has some paper crinkling on the right central margin in the black. On the bottom right and left vertical margin there is slight edge wear also. The rest of this poster is excellent. “Buy This Poster” button adds a $10 base charge for shipping a folded or rolled poster or $15 base charge for a Linen Backed poster within the USA. If outside the USA, please select the appropriate surcharge to your cart. If you do not see your location please <CONTACT US> and we will provide a shipping quote. We combine shipping.